The breeder behind Serious Seeds, Simon, is responsible for the genetics sold by the seed bank. He studied biology at one of the universities in Amsterdam. Simon discovered the merits of smoking pure marihuana after his studies whilst traveling through Africa in 1986. From that moment on he started collecting seeds and back in Holland he immediately started growing them out for personal pleasure crossing what he thought were the best plants seemed a natural follow up. Contact with other growers gave him access to different strains from which he also selected the best plants. The genetic background of this material was not always clearly known. Simon was teaching biology at a high school when Alan Dronkers asked him to come and work at Sensi Seeds. It was a serious career change but one he has never regretted. In 1994 after a period working for Sensi Seeds he decided to leave and start his own seed company with some American cannabis refugees. That year AK-47 and Chronic both won prices at the Cannabis Cup in Amsterdam. 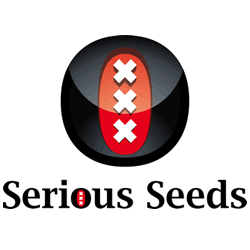 After the show the initial seed company ended and in 1995 Serious Seeds was founded.